There’s no denying that the gift that keeps on giving is in fact alcohol. 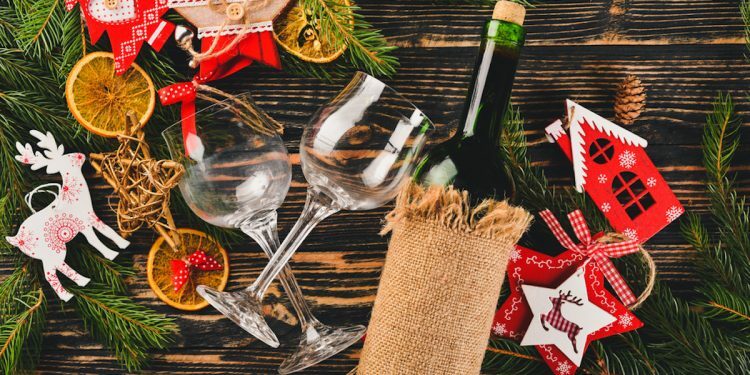 This Christmas, whether you need to buy a gift for a family member, a friend or a colleague in the office – we all know an alcohol connoisseur, lover or casual drinker. Whether they enjoy whisky, a glass or two of red, rum and even gin baubles – there’s something for every type of liquor drinker! 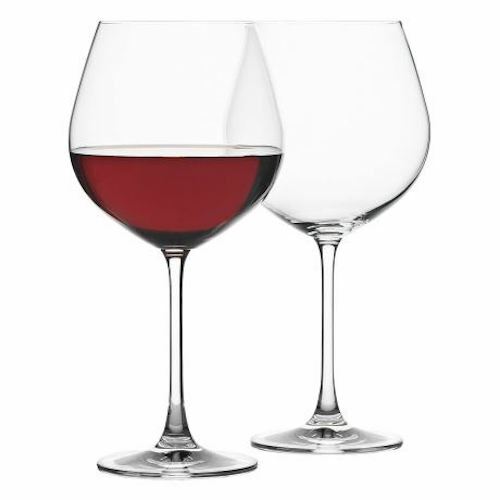 The perfect Christmas gift for any sommelier or red wine lover out there – the Terroir red wine glasses. Made from crystalline glass in Slovakia, this set of four-dishwasher-safe wine glasses will be perfectly paired to a bottle of tawny or Shiraz. With a wide rim and bowl, this glass is suitable for swirling, smelling and of course tasting. An hour out of Newcastle’s CBD in Pokolbin is family operated winery, Harkham Wines. 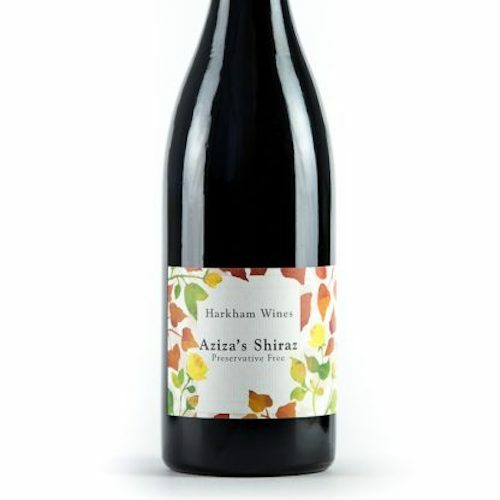 Aziza’s 2016 Shiraz is preservative free, hand harvested and fermented using traditional southern-France methods. 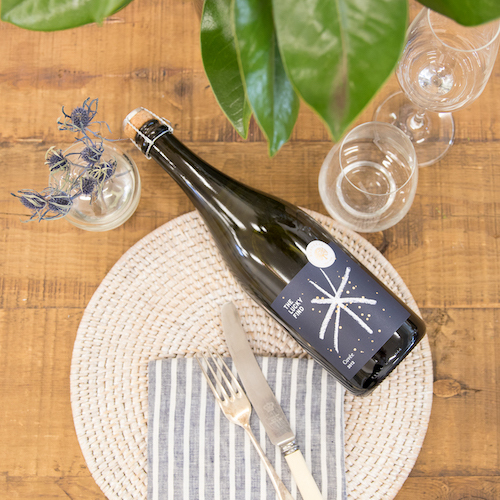 With all of Harkham’s collections grown and produced using sustainable farming practices, sommeliers will be pleased knowing that all of their products are 100% natural and handpicked. Central to Orange and Tamworth in New South Wales is Mudgee, since Burnbrae’s establishment in 1968 they’ve been commonly known for their Award Winning Wines. Similar to your special someone, the 2012 ‘The Lucky Find’ Cuvée will be a find too good to leave behind. With a crisp, bubbly yet delicious taste – this bottle will be a wish come true. 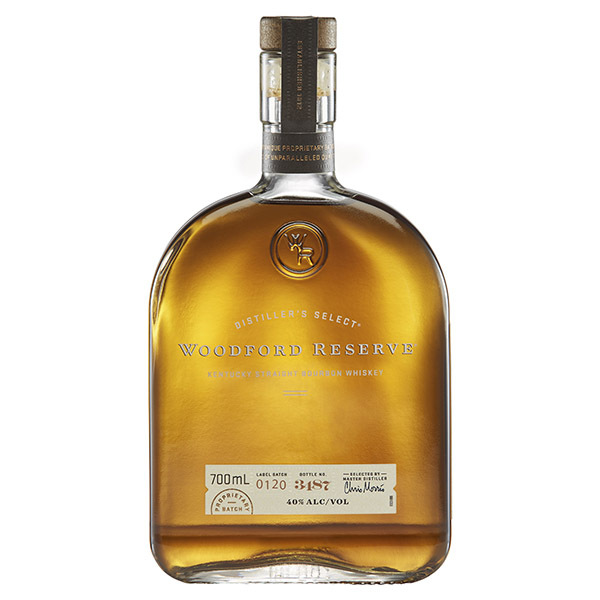 Winning international awards since 1999, Woodford Reserve Bourbon Whiskey is a highlight of the Kentucky Bourbon collection. With over 200 detectable flavour notes, the Bourbon Whiskey is made in small batches. With its distinct honey-amber colour, whisky connoisseurs will notice its smooth yet spiced flavour infused with rich fried fruit that’s dusted lightly with cocoa and cinnamon. Exclusive to Myer, modern Australian lifestyle brand Vue has created the perfect gift this Christmas, their Verona Wine Carrier. 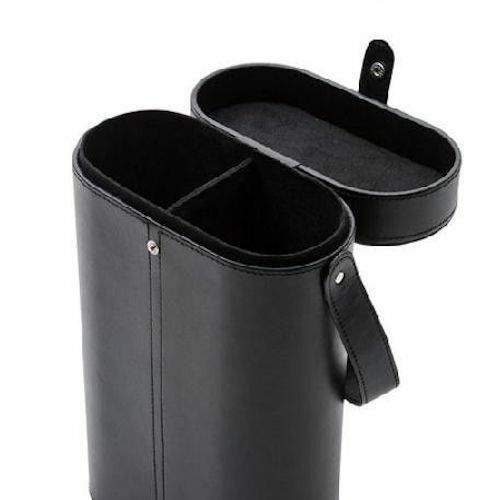 Featuring an elegant, modern leather look alongside the carry handle and snap button fastening – the Vue Verona Wine Carrier is the perfect gift for any wine lover or sommelier always on the go. 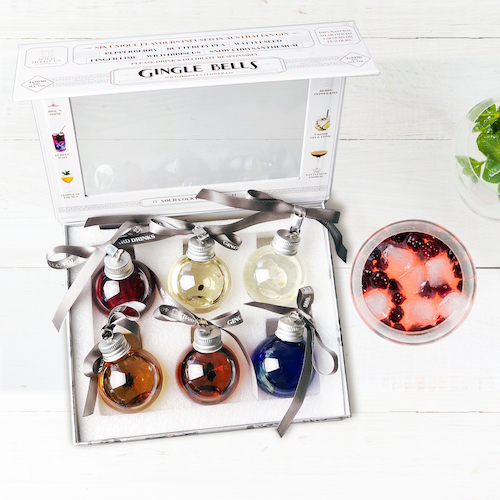 Operated by renowned Wild Hibiscus Flower Company, this year, the Christmas gift to take over our Santa wish list is the Gingle Bells Gin Baubles. Available in one, three or six sets – this is the perfect gift for any gin lover out there. The baubles contain one of their six various floral infused gins. Accompanied by a cocktail recipe per bauble, the hanging balls are perfect as a present or as a unique Christmas tree decoration. 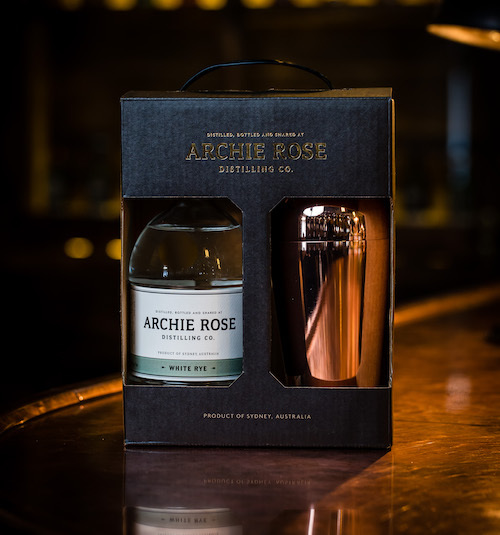 Shake up Christmas gifts this year with the Archie Rose Bottle and Shaker Set. Available for customers to choose between original vodka, signature dry gin, white rye or Distiller’s strength gin will be the hardest decision. 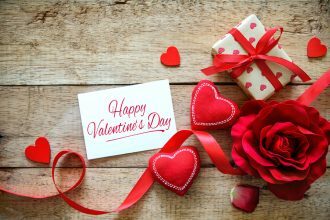 Accompanied by an engraved two-piece Parisian copper shaker and cocktail recipe booklet – this will be perfect for any lover of the Sydney micro-distillery or simply gin! Sydney based Brix Distillers Gold Rum is the perfect purchase for any rum connoisseur. In collaboration with their international master distiller and blenders, each bottle contains a rich, complex blend uniquely infused Caribbean aged gold rum. 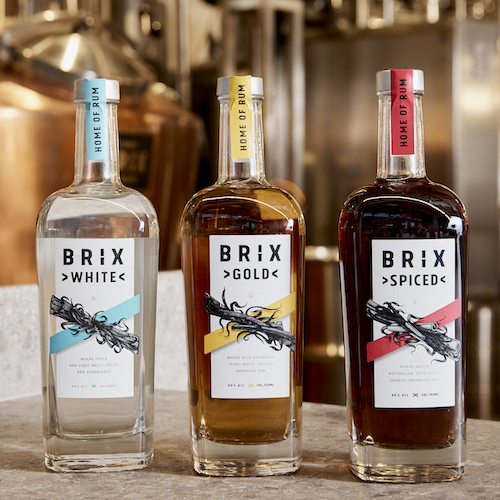 Also available are Brix Distillers White or Spiced rum; both sourced with Australian ingredients and crafted in Surry Hills. Drink your way through the 12 days of Christmas with this whisky inspired advent calendar created by Drinks By The Dram. Featuring twelve various wax sealed, 30mL drams in a pop-out window calendar. Featuring Glenfiddich, Johnnie Walker Black Label, Rock Oyster and Talisker to name a few. Also available are The 12 Days of Ginmas and The 12 Rums of Christmas. Two of Saltram Wines finest creations from the heart of the iconic Barossa Valley will be the perfect gift for any wine lover this Christmas. Featuring Saltram Winemaker’s Reserve Barossa Shiraz 2014 made from select parcels of Shiraz with notes of dark berry fruits and spice. As well Mr Pickwick’s Particular Tawny with an invigorating sour, nutty, sweet, fresh toffee, coffee and dried fruits notes. The ultimate gift pack this Christmas is brought to you by Cellarmasters. The Icon Gifting Six Pack is self-explanatory, an icon in itself. With a compilation of 53 medals won between the six bottles; your red wine lover will be awe by the carefully selected range available in the sleek wooden gift box. Featuring wines from Mockingbird Hill, McLean’s Farm, Black Wattle, Shark’s Block and two Langhorne Creeks. 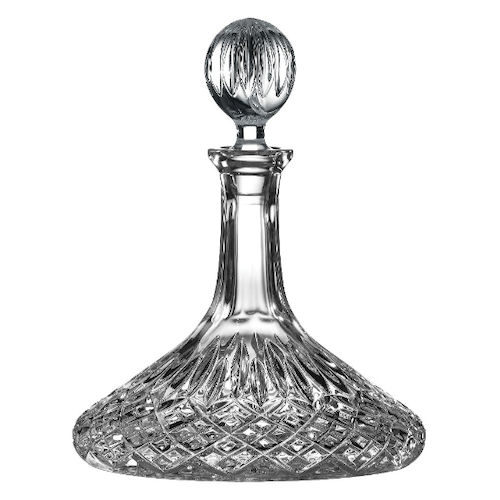 Made from lead crystal, the Royal Doulton Highclere Ships Decanter will be the most impeccable gift to receive this Christmas. Featuring a stunning, quintessential diamond cut carved onto the crystal walls of the decanter; the Highclere is ideal for Scotch, Irish Whiskey or fine American bourbon. This will surely be the highlight of their bar or Christmas table. Don’t feel like purchasing all your gifts this Christmas? Well, you could win them on us! Check out Hunter and Bligh’s 12 Days of Christmas Giveaways!